This result is often proven using integration by parts – but the equation expresses a local condition, and should be derivable using local reasoning. 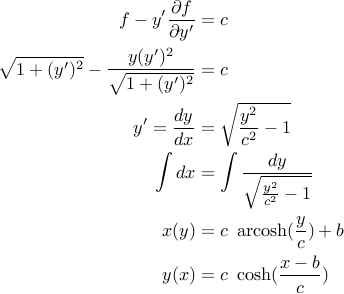 We will explore an alternate derivation below. Physical systems in stable equilibrium will move to a configuration that locally minimizes their potential energy. For example, consider a chain draped over two pulleys (at height , separated by distance ), with excess chain resting on the ground. The chain will take a shape between the two pulleys that minimizes its gravitational potential energy. The space is interesting: If the chain is taut, then it will be high above the ground, and have high energy. If the chain is very saggy, it will pull up lots of chain from the ground, and have high energy. In between is the optimal shape. We have integrated only along the section between the pulleys, because we can define at ground level, and ignore constants (the energy of the chain dangling outside the pulleys) and constant factors ( ). Now we want to find the function that minimizes (subject to the boundary conditions ). For to be a stationary point of , small perturbations to the function must not alter the value of (to first order). So consider an infinitesimal segment of (grey), discretized around . We will consider perturbing at by an amount (changing from the blue –> red), and examine its effect on . It alters the value of at . It alters the derivatives around . : The amount small perturbations affect by directly changing the value . : The net amount perturbations affect by changing the derivatives in the neighborhood of . (the derivative to the left increases, and to the right decreases – so the net effect depends on how changes over the span ). At a stationary point, these effects must exactly cancel. For completeness, we derive the solution to the example, and extend it to the case of a fixed-length chain. Thm: If , then is a constant. Where the last step is applying the original form of the Euler-Lagrange equation. For constants chosen to satisfy boundary conditions. This gives us the familiar catenary curve. We know the catenary is also the shape formed if we hang a fixed-length chain between two fixed endpoints. This is no coincidence. 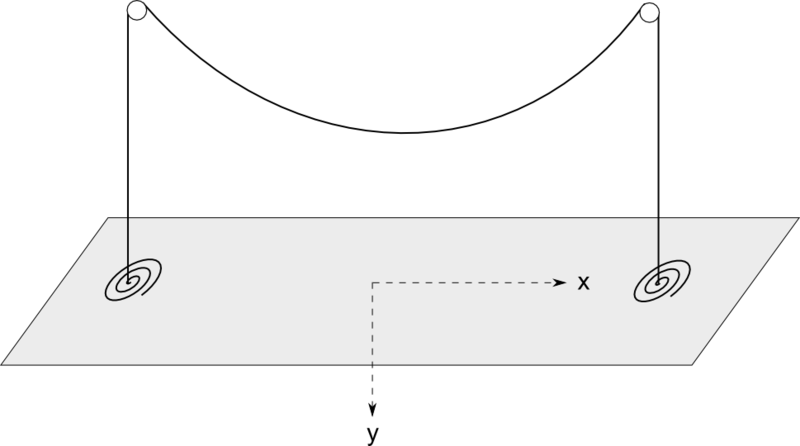 The fixed-length chain problem is a constrained minimization problem, with the same potential energy functional , but the additional constraint that the arclength of is some specified constant. Specify constrained problems by – separation distance and chain arclength. And unconstrained problems by – separation distance and height. Theorem: For a given constrained-problem , there is a corresponding unconstrained-problem that contains the constrained-problem as a sub-problem. Therefore the constrained problem must also be a catenary. Lemma: For any , we can always find some unconstrained configuration such that the length of chain between and is exactly . So any value of in this range is achievable for some – and further, there is some that gives rise to this (in particular, works). Result: Now, given a constrained-problem , construct an unconstrained-problem such that the length of chain between and is exactly . (which Lemma guarentees we are able to do). Over this span, the unconstrained problem is identical to the constrained problem: arclength , and endpoints separated by . If one situation's optimal-solution (say A) had lower potential energy (over the span) than the other (B), then B could assume the form of A over the span, without violating any constraints but resulting in lower energy. Contradiction of optimality, so both problems must have identical solutions over the span – and the constrained optimal solution is also a catenary.